University of Delaware researchers and industry partners have developed a new method for constructing offshore wind farms. Pictured here is the first U.S. offshore wind farm located about 3.8 mi. from Block Island, R.I. Working closely with industry partners, University of Delaware researchers have developed a new method for constructing offshore wind farms and proven that it is cheaper, faster and could make possible offshore wind deployment at a scale and pace able to keep up with the region's scheduled retirements of nuclear and coal-fired power plants. The researchers calculated that their innovative process will cost up to $1.6 billion less per project than conventional approaches and take half the construction time. The key insight that allowed Kempton's team to make such considerable optimizations in cost and deployment speed was that the entire structure, from seafloor mounting to the top of the turbine, can be assembled in one piece in port, moved as a unit, and in one step placed into the sea floor. It may seem like a simple idea, but it was by no means obvious that it would work with existing equipment until completing the detailed engineering and cost analysis. The reference design used 10-megawatt turbines with support structures, together standing twice as tall as the Statue of Liberty and weighing 2500 metric tons, the equivalent of 183 semi tractor-trailers. Figuring out how to build and move them around in port was the final hurdle surmounted in the five-year study's new construction method. 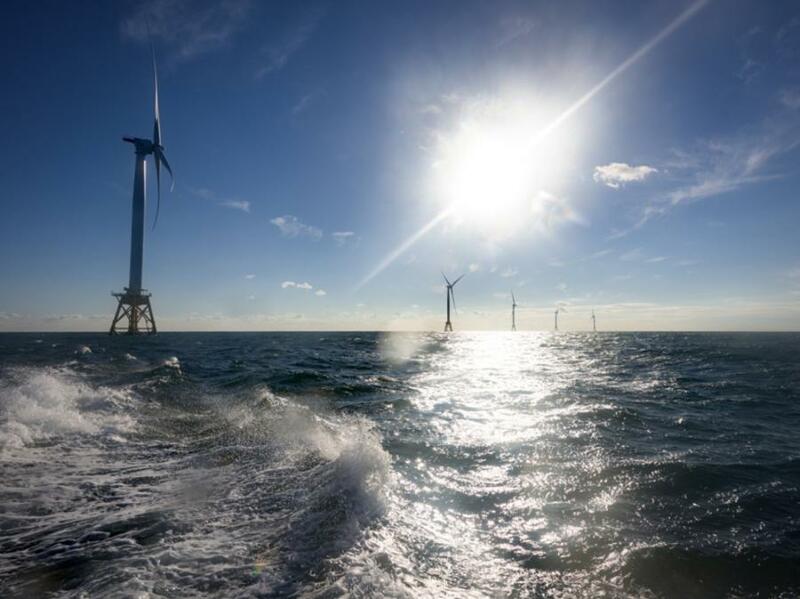 In addition to cost savings, there are non-monetary benefits: shifting more of the assembly to land enables construction to proceed regardless of the weather and reduces time at sea from three days to 10 hours for each turbine installed. Integral to the method is to anchor the turbines by suctioning large buckets to the seafloor rather than pounding in long cylinders of steel, called piles. This also means that the foundation doesn't penetrate as deeply into the seafloor, which reduces costs for everything from the attachment process to the surveying required in advance. And without pile driving noise, installation has no acoustic impact on marine mammals. The UD team members included Kempton and CEOE colleagues John Madsen, a continental shelf geologist, and Jeremy Firestone, a wind power policy expert, as well as mechanical engineer David Burris. The team began with a dozen possible design solutions, which they whittled down to four construction scenarios worth evaluating for detailed engineering and cost. To assess the different approaches, the team designed a hypothetical 1-gigawatt wind farm in the Delaware Wind Energy Area off Rehoboth Beach, Del., using the port near Delaware City (now an abandoned chemical site and an operating refinery). One gigawatt is the size of the largest nuclear power generators; the power from each offshore development this size would power 300,000 houses. “Delaware City is one of only a handful of ports on the East Coast that actually could support this kind of work in the future, at scale, although it would need some upgrades first,” said Kempton. Madsen's assessment of seafloors showed the new approach could be effective from Cape Hatteras, N.C. to Massachusetts, and that it has the potential to work elsewhere after similar geological evaluation. Burris' research on turbine bearing wear and failure led the team to conclude that transporting turbines with installed blades would reduce lifetime. Transport with attached blades also is unstable. Instead, the researchers developed a mounting for transport and a method to attach the blades in place at sea. Collaborating with active commercial partners provided much-needed industry expertise and practical knowledge that comes from working directly in the field, Kempton said. “We knew we had to do that to be realistic,” Kempton said, adding that the cooperative effort with experienced partners gave their results added credibility to the wind energy industry. This project was funded by the U.S. Department of Energy as project DE-EE0005484. The full report is available at ceoe.udel.edu/research/affiliated-programs/wind-power-program/research-projects/industrializing-offshore-wind, along with two videos to compare the new construction method and the conventional approach.